Home or after school work is a common expectation for most primary aged children. Parents can help children develop sound study habits from a young age which include establishing a predictable routine, encouraging effective use of time and helping them to be organised. AGBU Alexander Primary School has a clear ‘Homework Policy’ that is reviewed at the start of every year and a concise ‘Parent Handout’ is made available to all families. Our policy states that homework is set for all children in Kindergarten to Year 6. It is work set by a teacher to be completed outside the classroom environment and is assigned to help develop home-study techniques in students. Students who develop disciplined and positive home-study habits in the primary years are more likely to be able to continue with these home-study habits in the secondary school and during tertiary education when homework is less structured and a student is expected to develop their own individual home-study timetable. Positive home-study habits will enhance student success. Homework can also be a means of giving students an opportunity for further practice and consolidation of skills and knowledge taught during class units of work. It can be used to extend the more capable student and to reinforce programs run by the school. It is also accepted that homework should be challenging, interesting and relevant to classroom activities. Homework should not be too difficult or unfamiliar. Students need to succeed with homework: it should not be frustrating either for them or their parents. Accordingly, homework should not introduce new, unknown activities. w Establish a predictable routine. If homework is done at the same time each night (make sure this is not left too late or near bedtime), getting started is usually less of an issue. w Establish a good working environment. Make sure they have a quiet area away from distractions that is well lit and with good ventilation. A table or a desk makes a good workspace, although don’t be surprised if they spread their work out all over the kitchen table. Some children just love to be around others. However, homework should not be done while watching television. w Encourage children to work reasonably quickly and efficiently. Have a set time limit which they should stick to. A little work each night is more productive than packing it all into one weekly session. 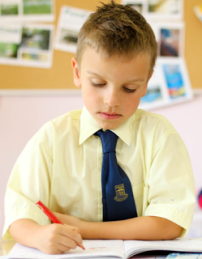 w Encourage children to become organised by planning homework around their extra-curricular activities. A weekly planner or diary will help older students to organise themselves. w Be realistic and don’t expect to solve all homework difficulties. When in doubt send a note to your child’s teacher letting them know the problem. They will appreciate being informed.